The necessities that are required to keep our businesses going don’t care about the economy. And the equipment that we need to perform the job up to our standards, whether it is a used vacuum truck or industrial cleaning equipment, always carries a fairly steep price tag. But if you are in need of new gear you might consider purchasing something that’s new to you instead of just plain new. Used industrial equipment can save you big money and do the job just as well. Whether you are a new company looking to ready your fleet for the task at hand or a company that has been around for years and just needs to replace old trucks and such, used industrial equipment can provide a huge benefit to you. And depending on your needs, each piece of equipment can bring a great amount of efficiency and value, meaning a quick return on investment for your business. A vacuum loader, for instance, can allow for quick and efficient cleanup of whatever your business demands. There are used vacuum trucks that are small and easily maneuverable as well as larger units that can hold just about anything. But industrial cleaning equipment doesn’t just end with a vacuum loader. There are plenty of industrial machines out there to help build or grow a thriving service. And even better, it can almost all be secured as used, saving you thousands when you may need it most. Used industrial equipment can also help your budget go further. If you aren’t trying to secure something specific for less money, you could acquire a better model or version of something that would normally cost thousands more. A good example of this is that you may be able to put into play more advanced industrial cleaning technology that would normally be out of range. 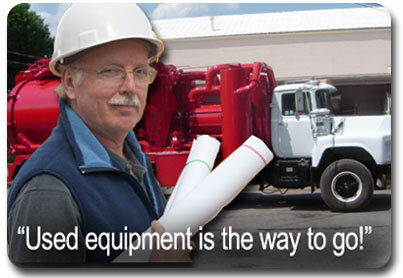 One of the newest and most exciting things happening in this realm is the use of multi flow systems in cleaning trucks. With a multi flow system, the amount of water displacement can be set by the user. This can lead to more efficient cleaning, less gas consumption, and more effective use of water, meaning less refilling. Things like these will only increase the amount of money you save long term. Since this is fairly new and usually available on more expensive models, the purchase of used industrial equipment could easily help you position equipment like this in your cleaning arsenal.